Union Pacific and DB Cargo H0 models. Pinball machines, jukeboxes and Horses. What went wrong with the image of model loco boiler/tender top? Not matching from Prototype. Wow that's a long locomotive. What is the length? Weight? Will it be able to negotiate sharp curves? length? 42,5cm... Weight? Big Boy 37990 it's around 1,2 kg... If the construction will be the same the weight will be around 1 kg. Thanks for sharing! This loco will be awesome! I already have 5 Big Boys and I wouldn´t mind this smaller beast. It's only 4 cm. shorter than the Big Boys. Do you think Märklin will stop releasing the Big Boys ending with 37996? Good thing that Märklin lists older cars to go with the loco as I'm missing alot of the latest car sets. I wonder why this wasn't announced in the Herbst New Items? I also see there is a 39960 DRG Br96.0 has been announced separately from the Herbst NI. Forgive me for saying this, but isn't this a bit of an odd choice? A bit too similar to the big boy, limited market pool of buyers, and MTH already makes one for 3 rail? Unless perhaps they got crafty and bought the Lionel HO mold and reissued? Great loco for sure, but seems like there were many more logical models to invest in sooner. Has MM 05/2016 actually been released, or is this a hoax? Where did your friend get the magazine from? That last photo looks suspiciously similar to previous magazine photos announcing the Big Boy. There's no Insider Magazine 05/2016 on the Insider Club website (which there normally is before the MM is released), and there's no mention of 39911 in the Marklin product database, whereas there is mention of the 39960 Alan talks about. The only mention of 39911 on Stummi's forum is a link back to this thread - normally I'd expect to see mention on Stummi's before here. That one's in the New Items 2016 (Nurnberg Toy Fair announcements). I don't know if this "Little Big Boy" is a genuine product. Looks to me like the fake British "Warship" diesel announcement that was around a few years ago. Märklin collector since age 5. H0 Collection from 1935 to today. mmh? Not sure about these! They certainly look good, but once you see how they are wired and assembled, it's quickly **scary**! If you have a chance, open one of their GG-1s...and you 'll understand what I mean! I'd rather stay with Märklin when I have a chance. Looking forward to add a Challenger to my UP collection. Scary? I think you found the way it's wired scary because we are used to a single board concept whilst mth protosound system has at least 3 diferent boards. True, it looks scary, but it doesn't represent a risk to the machine operation. I have the mth challenger and I can tell you, the way is assembled is quite sturdy. 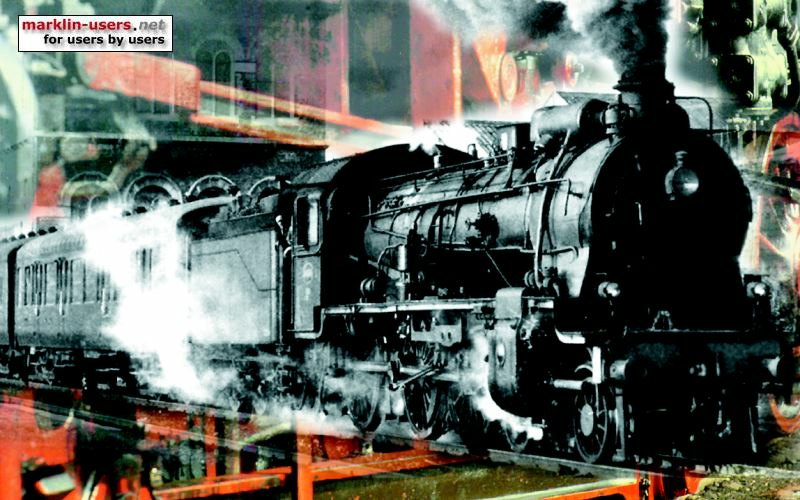 Could anyone please post a sharper picture of the locomotive or of the whole article (unless not possible because of copy rights)? Preferably also if the German version of it, if it's available. Looks to me like the fake British "Warship" diesel announcement that was around a few years ago. Just kidding. I painted this one for the one who made the "globetrotter" leaflet. You didn't fool me.......(although you nearly did) - I saw your username and wondered what nice new paint job you'd been doing! Here is a fake brochure (april fool in 2009). That was a nice job! The Marklin Magazin 5/2016 is scheduled for early October delivery. My main suspicion is the page numbering. The Challenger article seems to start on page 8, however, feature articles seem to start on page 12 in recent issues. This would probably mean four less pages of smaller announcements and in house ads. It show on Marklin database today, RRP 729.99 EUR. I knew it...i knew it!! It present only limited functions with the CS2. That means CS2 will not been upgrade to more functions. I´m suprised that "Challanger" do have mfx+ (my world) and it´s an generation 3 decoder. What a strange way of looking at this! How do you turn the announcement that this loco will give you 28 functions with a CS3 as something negative! Is your only purpose on this forum to find fault with everything Marklin does? Personally I don't believe we need more than about 10 functions ever, as I have not the slightest interest in hearing the driver sneeze or the window creak as it opens. However, those who cherish these things should welcome the first loco from Marklin that can achieve that many functions, albeit with a new controller. Small C track layout, control by MS2, 100+ trains but run 4-5 at a time. I don´t understand what you mean. CS3 do have 32 functions to control with it. CS2 do only have 16 functions and will not been upgrade to more functions. If you buy "Challenger" you need CS3 to control all functions with the locomotive. Of course you can also drive this model with the CS2. I did only clarify about the CS2. Well, when I look at the Märklin product page, I only see the "Control Unit", the "Mobile Station", the "Mobile Station 2", the "Central Station" and the "Central Station 3" mentioned. To me that is 6021, 60652, 60653, 60212 and 60216. Where do you find information about the "Central Station 2", the 60215 ??? I've just received an email from Brenda Hensleigh at Marklin USA, announcing both the Trix and Marklin models. Pricing for both is $800 USD each. 22939_Flyer_D_E.pdf (523kb) downloaded 54 time(s). 39911_Flyer_D_E.pdf (517kb) downloaded 78 time(s). I just found the loco on Märklins homepage for 730 € and its 29 functions for the CS3. For this price I would prefer the TEE VT 11.5 - love this one more . But my internet dealer send me a mail today announcing the shipment of my brandnew S 2/6 mfx+ (# 37017) in blue. This makes me more exciting. Good thing that MÃ¤rklin lists older cars to go with the loco as I'm missing alot of the latest car sets. Well, they certainly COST like cars! 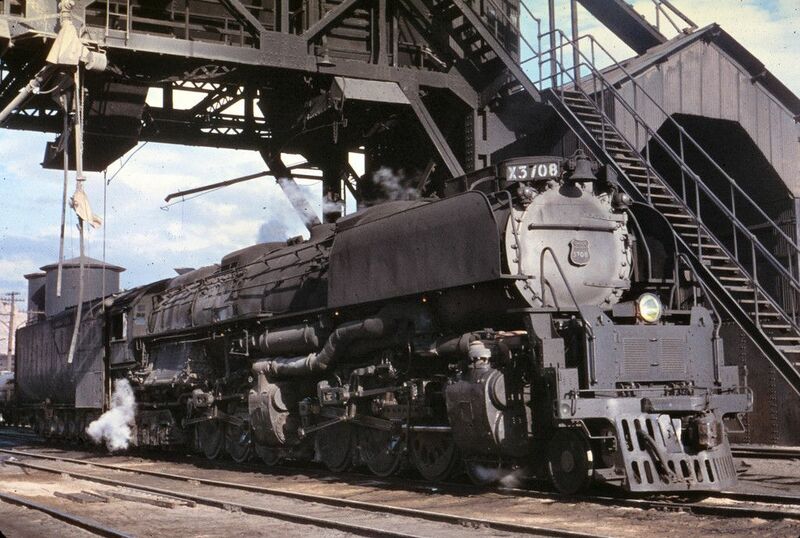 This particular series of locomotives were also built for the D&RGW who subsequently sold them to the Clinchfield RR. I believe maybe the Delaware and Hudson had a few, so there is opportunity for Marklin to spread their marketing, particularly in the Trix brand. HO Scale - Märklin (ep III and VI, C Track, digital) - 2 rail (USA and Australia) - 3 rail (English Hornby Dublo) - a few old O gauge. The central station included all models...first and second generation. "2 smoke generators (7226) can be installed in the locomotive; the contacts for them are on constantly." 29 functions available and not a single way to make it digitally on or off? I can see there are a few possible "cut and paste" errors in this description. Further on it says that the smoke is controlled digitally. I ordered my Challenger this morning at what I think is a very good price. I too have the MTH Challenger, in fact I have two of them. They are a little finicky, but I do like the synchronized steam. Of the MTH steamers I have, the one I thought would cause the most problems actually runs the best, the Triplex. In all I have over 50 MTH locos (I have around 90 Marklin locos). BTW, with MTH, I count each powered unit as a loco since you can address it uniquely if you want. They are not as robust as Marklin locos, but they are not bad. And they are less expensive. I have actually gotten most of my MTH locos at very,very good prices. And at least they have a variety of engine types and road names. It is nice to see Marklin bring out a new US tooling. Could they have picked something different? Sure, but the Challenger is a nice model and they can re-release it in different road names/color schemes. I have to agree with Robert. He did an excellent job articulating the experience with MTH 3e+ (Marklin) models. I also love the MTH for Marklin models. They have great detail, good decoders, and provide an excellent way to expand US motive power on a Marklin system by loco type and road name. They also MU extremely well, even GP35s and F3s will MU together well. I would not hesitate to recommend them, but they are not without occasional flaw. Keep in mind that MTH challengers may cost less, but also require 18" curves (R3 are 20.28", although I wonder if one could get away with R2 curves at 17.20"? ). Marklin locos (Big Boy, Challenger, etc) all run as small as R1. Out of 10 MTH locomotives in my fleet, two have required return trips to MTH for repair out of the box. These were repaired free under warranty, and with no hassle from MTH, but it does take some time. Also, MTH locomotives run fairly well, but they are more prone to derailing. Sometimes if the track is dirty and a locomotive hits a dead spot, the following unit will push the lead unit into derailment over a turnout or vice versa. The GP35 units, if they loose power, will loose sound and lights unless you stop the locomotive, and begin the startup sequence again (I assume due to decoder fw, the F3 units do not do this). I know others have different experiences, but I have found Marklin units to be very difficult to derail. If Marklin offers the same unit as MTH, I would always personally prefer to purchase the Marklin version. Without debating on motor type, I would be willing to guess that it would be easier to repair a Marklin unit in 15 years time than an MTH unit. Regarding the smoke, I suspect there is a loss in translation. I would guess the contacts are on all the time during analog operation, but digitially controlled on/off during digital operation. I do think at this price that the smoke units should be included, but perhaps I expect too much? 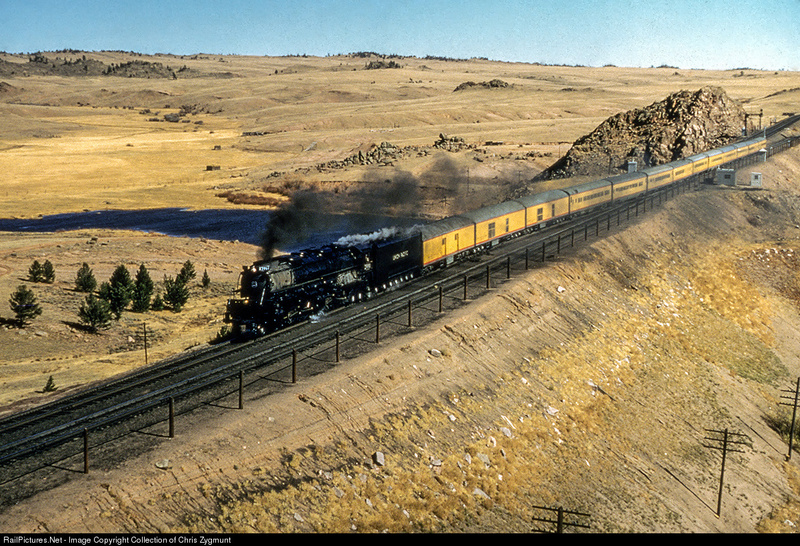 UP Challenger 3969 thunders over Sherman Hill in Cheyenne, Wyoming on October 2nd, 1956. Ok, last one, I promise. 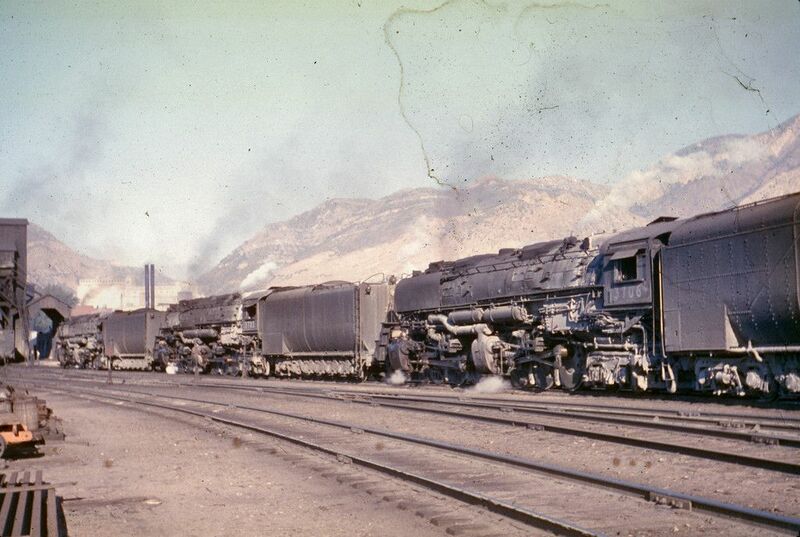 The prototype herself, 3706 and 3703, with some Siblings in Ogden, Utah. Date still unknown. I have written a message to the Märklin Customer Service - in German- inquiring about a clarification on this paragraph about the smoke generator. Hopefully, they will answer soon and dissipate the doubts around this issue. 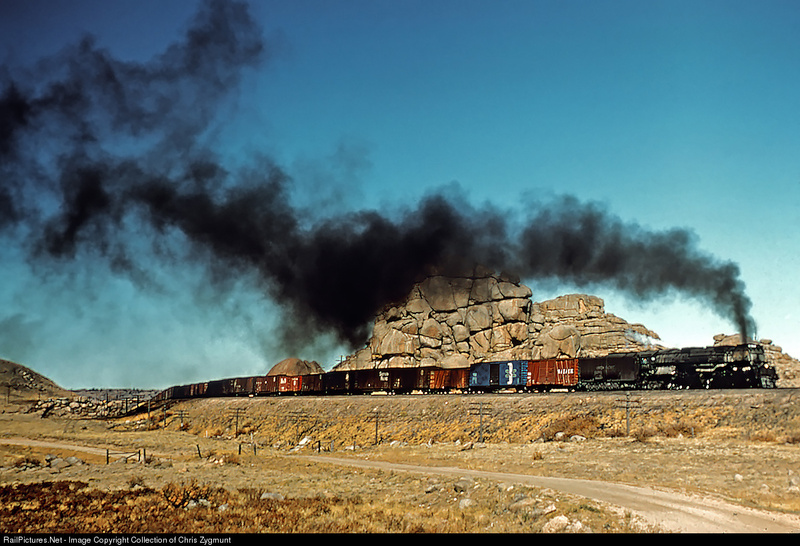 It would seem unthinkable that these expensive (although, probably made in China) locomotives will have zillions of functions or sounds while this most important smoke generation control may have gone overlooked. I have received an answer to my query from the Märklin Customer Service, in connection with the smoke generator. It turns out that the text in the locomotive description was not clearly written. The smoke generator is on at all times in analog operation, but it can be controlled in digital operation. I did not expect less from this locomotive. Here's a copy of the text from the Märklin Service: "... Jeder digital schaltbare Rauchsatzkontakt ist normalerweise analog immer an. Wir werden den Text „Kontakte ständig betriebsbereit“ entfernen." I have a couple of MTH steamers and I can't complain about their performance; based on what I've read across the net, I'm a lucky one. It would be great if M decides to start implementing synchronized smoke devices instead of the current (and boring) 7226 heathers. I had finally given up hope that M/T would produce a Challenger, and bought the 3-rail MTH version this spring. I agree with other comments that the MTH loc is a nice model, especially the representation of the independent chuffs from the two sets of cylinders. The M/T model would now be a bridge too far for me, family-wise. Figomima division, UP; mostly figment of my imagination yet. I only heard about this announcement yesterday when I received an email from a German dealer. It seems an excellent choice to me, though I was very surprised as it has been many years since M released any newly tooled US outline models. Back to heady days of the Big Boy, Alco PA1 and Mikado in quick succession. I have a lot of Union Pacific rolling stock for one of these to pull....there is just the little matter of 730 euros at our current poor exchange rate. Does anyone know of any dealers in Europe who may offer more than the 'fixed' 10% discount? Click on the zoom of the picture! This page was generated in 1.600 seconds.